Vintage 1963 Porcelain Texaco Diesel Chief Gas Station Sign > Antique Oil 9287. We have up for your consideration a vintage 1963 porcelain Texaco Diesel Chief gas station sign. This sign was mounted on the gas pump. It has beautiful deep color. It would make a great addition to your sign collection. The sign is 18" tall and 12" wide. 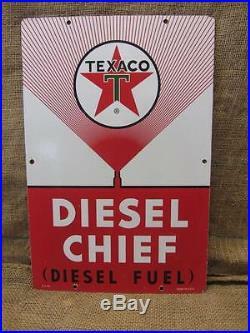 Texaco Diesel Chief, Diesel Fuel, 3-3-63, Made in USA. Good condition for its age with no dents. It has minor to moderate chips, surface rust and scratches. See description above for further info on the condition. The item "Vintage 1963 Porcelain Texaco Diesel Chief Gas Station Sign Antique Oil 9287" is in sale since Sunday, March 22, 2015. This item is in the category "Collectibles\Advertising\Gas & Oil\Gas & Oil Companies\Texaco\Signs". The seller is "*miliki*" and is located in Red Oak, Iowa. This item can be shipped worldwide.